The reservoir volume and flow capacity per unit area are steps toward finding total reservoir volume. Average values for comparing the quality of reservoirs are also useful results from log analysis. 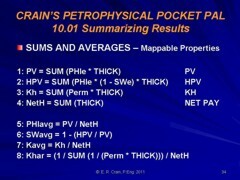 Pore volume (per unit area), hydrocarbon pore volume, flow capacity, and the averages of core porosity, water saturation, permeability, net pay, net reservoir, net sand, and gross sand are called mapable properties, petrophysical properties, or reservoir properties. Do not use the following algorithm in thinly laminated shaly sands - see alternate method shown below. The harmonic average most closely reflects radial flow into a borehole. If equal sample intervals are used, this geometric formula becomes: Kgeo = (PROD (Perm * INCR)) ^ (1 / INCR). where INCR = data digitizing increment. It does not give the same result as the previous version if layer thicknesses are unequal. This spreadsheet provides a tool for analyzing and summarizing log data in a consistent format. It calculates porosity and permeability averages, suns pore volume, hydrocarbon pore volume, flow capacity, and net pay with user defined cutoffs in a table identical to that created by the "META/COR" spreadsheet for log analysis, making it easy to compare log analysis results to core data. 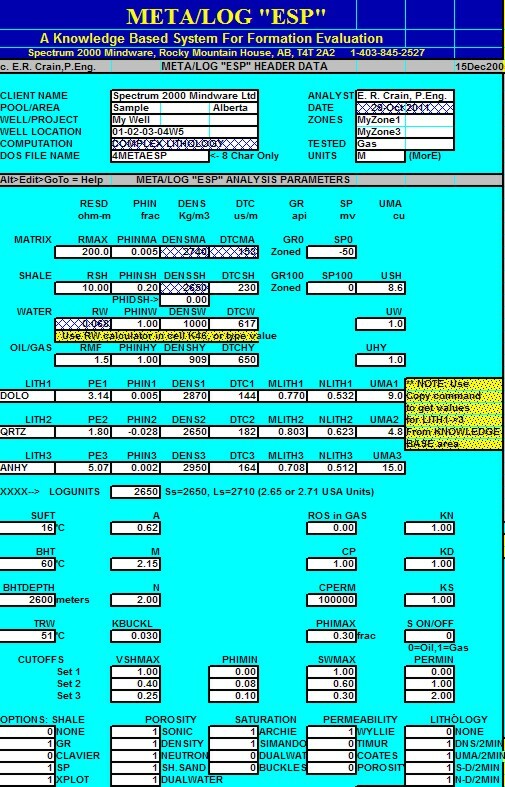 Log Analysis Spreadsheet for Conventional Oil and Gas, includes lithology, net pay, productivity, and reserves. English and Metric Units. 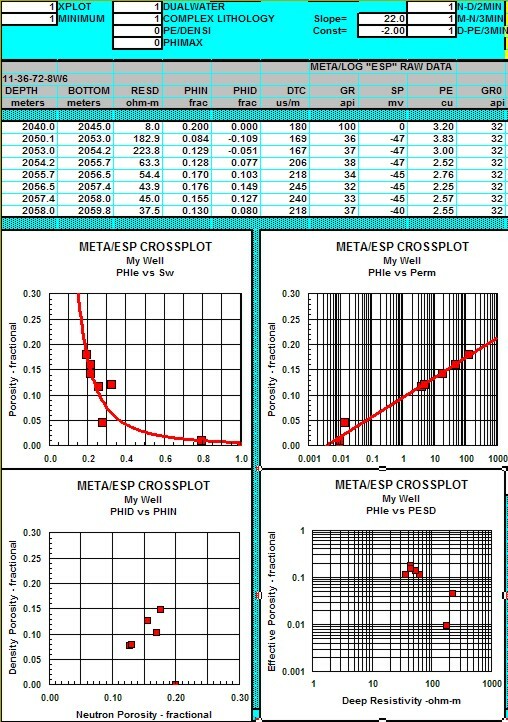 Exanple of "META/LOG" input data and crossplots. Intermediate calculations are performed offscreen to the right. The Summary Table (shown below0 is also off to the right. Individual Answers and Summary Table from "META/LOG" log analysis spreadsheet. Compare to core analysis results shown below. Summary Table from "META/COR". Compare values to "META/ESP" log analysis Summary Table shown above.